In the last week of April, the first bellwether trial involving lawsuits over alleged injuries caused by Xarelto (rivaroxoaban) began with the process of jury selection. The case is one of 16,000 Xarelto lawsuits under a federal multidistrict litigation (MDL) before District Judge Eldon Fallon in the Eastern District of Louisiana. All the cases allege that the drug manufacturers, Johnson & Johnson and its Janssen Pharmaceutical subsidiary, failed to warn healthcare personnel and patients about the potential for risks related to gastrointestinal bleeding. Xarelto is a new type of anticoagulant that is often prescribed to decrease stroke risk caused by atrial fibrillation (often referred to as afib). Specifically, the cases charge that doctors and other healthcare professionals were not warned that there was no antidote available, as there is for older generation anticoagulants such as coumadin (warfarin). Antidotes allow medical personnel to reverse the effects of anticoagulants (often called blood thinners) if necessary. Coumadin has been the standard anticoagulant drug for more than half a century. 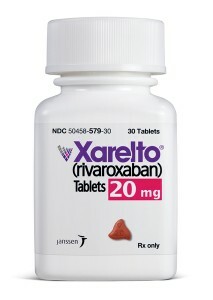 Xarelto, introduced in 2011, was initially marketed as easier to use. A case filed by a Louisiana man, Joseph Boudreaux, Jr., will be the first to come to trial. He was prescribed Xarelto in December 2014 to decrease the risk of stroke owing to afib. However, Bourdreaux’s suit states that he developed a severe GI bleed less than four weeks later. He was hospitalized and received several blood transfusions. The suit alleges that the bleed was a side effect of Xarelto. Bellwether trial results are not binding on other cases, but they are likely to have an effect on potential negotiations to settle the widespread number of Xarelto cases. Another anticoagulant of the same newer class as Xarelto, Pradaxa came on the market prior to Xarelto, in 2010. Similar injurious side effects have been alleged from its use. Ultimately, the manufacturer of Pradaxa was sued by more than 4,000 patients. After multiyear court cases, the plaintiffs received $650 million in settlements, right before Pradaxa bellwether cases were scheduled to come to trial. The average Pradaxa settlement per person was $150,000. The first Xarelto bellwether trial was postponed early in April. The second bellwether trial is scheduled for May 30, also in Louisiana. The third bellwether trial will occur in June in the Southern District of Mississippi. The fourth is slated for July in the Northern District of Texas.